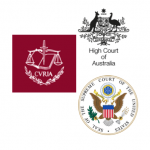 The incongruence of EU, US and Australian caselaw on the making available right (or its national equivalents, under the so-called “umbrella solution”) prompted my doctoral research on the topic, completed earlier this year. I was keen for the opportunity to share my comparative analysis and engage with an informed audience, and my session at CREATe on 2 November 2018 did not disappoint. On the surface, judicial interpretation of the making available right presents itself as a confusing tangle of disparate terminology. Examples include “volition” (US), the “new public” (EU), and the “copyright owner’s public” (Australia). Reliance on these ambiguous terms may be seen as a response to the challenges of identifying an “act” of making available, and defining “the public” in the context of individualised communications. Often, these disputes involve cloud technologies (e.g. time-shifting/streaming services) and linking. The aim of my research has been to look beyond the surface and delve into the themes underlying such decisions. By bringing these themes to light and recognising the deficiencies of continuing with current approaches, it is possible to plot a path forward for the making available right. Along the way of this project, I published an article and a book chapter on the making available right. This research will be brought together in a book, to be published by Edward Elgar in 2019. In this book, I argue that a framework of principles can be used by judges to bring more coherence and transparency to their decisions on the making available right. I have enjoyed speaking to the topic at various institutions this fall, at CREATe and also at the Max Planck Institute for Innovation and Competition, Lyon Law School and the University of Aberdeen Law School. I thank Dr Thomas Margoni for hosting me at CREATe, Ally Farnhill for organising the event, and of course the audience who delved into the discussion and gave me much food for thought. I look forward to continuing the conversation.